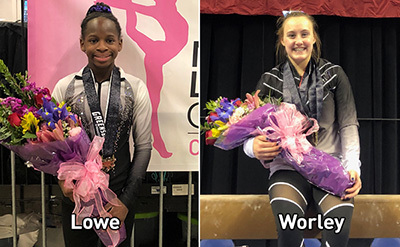 GREENSBORO, N.C., Feb. 28, 2019 – Amber Lowe of Cornelius, N.C./Everest Gymnastics, and Raena Worley of Christiansburg, Va./Virginia Techniques, qualified for the final junior and senior Nastia Liukin Cup berths at the 2019 Greater Greensboro (N.C.) Invitational. The 36-woman field for the 2019 Nastia Liukin Cup is complete. Slated for March 1 at 7 p.m. ET at the Greater Greensboro Coliseum Complex, the Nastia Liukin Cup kicks off the Triple Cup weekend that also includes the American Cup and Elite Team Cup on March 2. 2019 is the 10th annual edition of the Nastia Liukin Cup, which was started in 2010 by 2008 Olympic all-around gold-medalist Nastia Liukin. Twenty states are represented in the field that includes nine gymnasts who have participated in past Nastia Liukin Cups. Six – Makarri Doggette, Pickerington, Ohio/Buckeye Gymnastics (2013-14, 2016-19). Four – Kiya Johnson, Coppell, Texas/Texas Dreams (2014-15, 2018-19); Andrea Li, Aurora, Ill./Legacy Elite (2016-19); Cassie Stevens, Phoenix, Ariz./Arizona Sunrays (2015-16, 2017, 2019); and Gabryel Wilson, Ypsilanti, Mich./Olympia Gymnastics Academy (2016-19). Two – Gabrielle Gladieux, Greensboro, N.C./High Point Gymnastics, Ava Piedrahita, Gaithersburg, Md./Hill’s Gymnastics, and Faith Torrez, Kenosha, Wis./Legacy Elite (2018-19). The complete field is listed below. The 18 junior and 18 senior gymnasts qualified for the Nastia Liukin Cup based on performances at the 18 invitationals in the series. Senior athletes must be 16 years of age or older, and junior athletes must be 15 or younger.